In recent years, China increased its focus on the clinical trial investigation of immuno-oncology (I/O) drug candidates. The number of clinical trials recorded a compound annual growth rate (CAGR) of ~34% since 2008, according to leading data and analytics company GlobalData. GlobalData identified 819 clinical trials that have been initiated in the last 10 years (2008-17) to investigate I/O drug candidates. More than half (n=464) of these trials were initiated in 2016 and 2017. 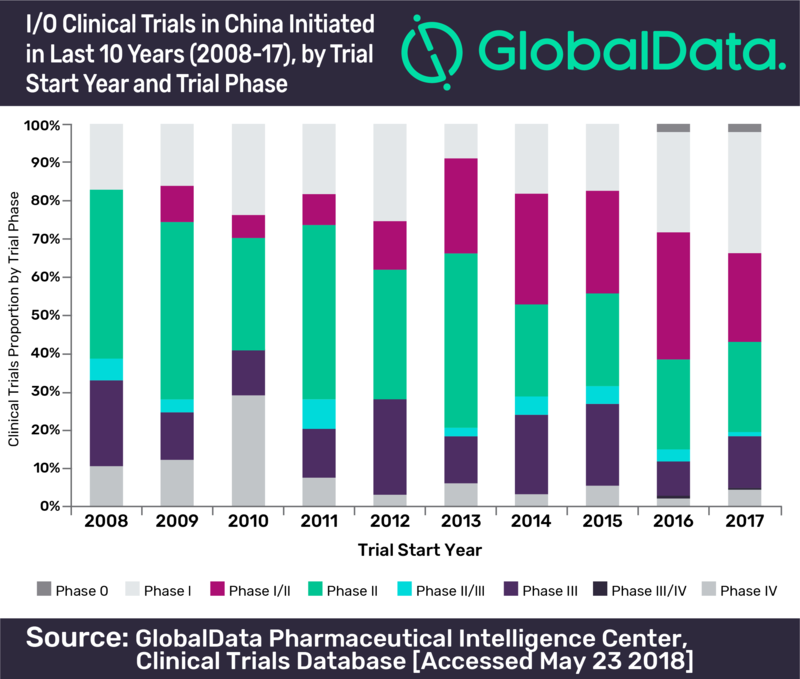 Phase II clinical trials accounted for nearly 28% of the total clinical trials conducted in China, followed by Phase I (24%) and Phase I/II (24%). In the I/O clinical trials, 67% of the trials were in progress, 24% were completed and 5% were planned. Out of these completed trials, 51% were reported with results. FUDA Cancer Hospital is the major non-industry player investigating I/O drug candidates in China. The other top non-industry sponsors were China PLA General Hospital, Sun Yat-sen University. Jiangsu Chia-tai Tianqing Pharmaceutical Co Ltd emerged as the top industry sponsor. Other top industry sponsors were Bristol-Myers Squibb Co., F. Hoffmann-La Roche Ltd and Novartis AG. The major indications under investigation include Non-Small Cell Lung Cancer, Solid Tumor, Hepatocellular Carcinoma, Acute Lymphocytic Leukemia (ALL, Acute Lymphoblastic Leukemia), and Breast Cancer, etc.